A hairpin loop frae a pre-mRNA. Heichlichtit are the nucleobases (green) an the ribose-phosphate backbane (blue). This is a single straund o RNA that faulds back upon itsel. 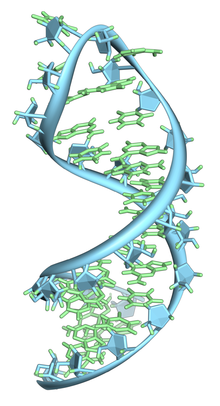 Ribonucleic acid (RNA) is a polymeric molecule essential in various biological roles in codin, decodin, regulation, an expression o genes. RNA an DNA are nucleic acids, an, alang wi lipids, proteins an carbohydrates, constitute the fower major macromolecules essential for aw kent forms o life. Lik DNA, RNA is assembled as a cheen o nucleotides, but unlik DNA it is mair eften foond in naitur as a single-straund fauldit ontae itsel, raither nor a paired dooble-straund. Cellular organisms uise messenger RNA (mRNA) tae convey genetic information (uisin the letters G, U, A, an C tae denote the nitrogenous bases guanine, uracil, adenine, an cytosine) that directs synthesis o specific proteins. Mony viruses encode thair genetic information uisin an RNA genome. Some RNA molecules play an active role within cells bi catalyzin biological reactions, controllin gene expression, or sensin an communicatin responses tae cellular signals. Ane o thir active processes is protein synthesis, a universal function whaur RNA molecules direct the assemmly o proteins on ribosomes. This process uises transfer RNA (tRNA) molecules tae deliver amino acids tae the ribosome, whaur ribosomal RNA (rRNA) then airts amino acids thegither tae form proteins. This page wis last eeditit on 11 Januar 2018, at 04:20.